Looking for the best nearby casual dining steakhouse and no-frills restaurant in Langley BC? MR MIKES SteakhouseCasual is about feeling like you belong, where everyone feels comfortable in his or her own way. It’s a place where you don’t have to be something you’re not, you can just be yourself and come as you are. 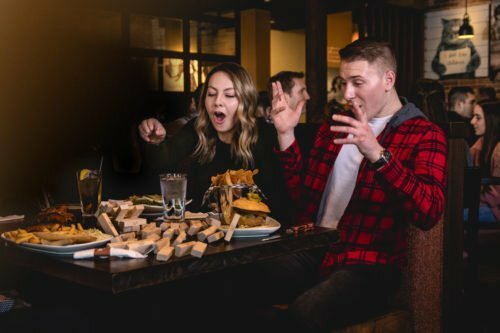 Enjoy tasty affordable creations like our Canada AAA signature steaks, famous Mikeburgers, tasty pastas, big bowl salads, and house-branded wines and beers. Great value. A daily happy hour. No stuffed shirt attitude. Just real people and great food. A favourite Langley BC restaurant, come in, unwind and enjoy our fantastic food and drink specials. Visit us today at our Langley BC steakhouse. And be as casual as you like. Delicious things are happening everyday at MR MIKES and we want to keep you in the know. Stay informed so when your spouse reminds you about your anniversary the day before you’ll be able to respond, “I know honey. I’ve got it covered.” And then remind them about the current feature you read about in your email. We’ve got your back! Wink!